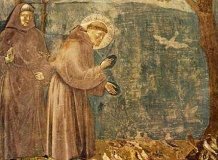 The Canticle of the Creatures (Laudes Creaturarum), also known as the Canticle of Brother Sun, is a composition in verse written by St. Francis of Assisi around 1224 and believed to be the oldest poem of Italian literature. >>Find a farmhouse in Assisi and visit the places of the Saint. >> If you want to organize a pilgrimage to Assisi find best accommodationin Assisi suitable for religious tours.